Talismanic magic is an intrinsic part of the ceremonial art in general, and cannot be considered apart therefrom; but being a special application of that art, it is entitled to special consideration. If a sacrament is the outward and visible sign of an inward and spiritual grace, a talisman may be considered as the material object in which the inward and spiritual grace is stored. A talisman is, in fact, nothing more or less than a spiritual storage battery. The manner in which a talisman works is difficult to define, but the fact that it works is a matter of experience. After we have considered the technique of the making of talismans we shall be in a better position to examine the principles involved and deduce an explanation of the nature and manner of operating of talismanic magic. If an occultist wants to draw to himself power of a particular type, or to stimulate a particular factor in his nature, he will start by analyzing that factor into its primary principles and assign it to its particular station upon the Tree of Life. For instance, all operations of a combative, or defensive nature would be assigned to Geburah, the Sphere of Mars; all those of an artistic or emotional nature to Netzach, the Sphere of Venus. Having thus classified his problem, he would then study the symbolism of that Sephirah according to the traditional significance assigned to it. Having got clearly in his mind a concept of the nature of the force in question, he will next consider its opposite aspect that maintains it in equilibrium; for instance, the opposite aspect of Netzach upon the Tree is Hod, the Sphere of Mercury, the intellectual as opposed to the artistic; the opposite aspect of Geburah is Chesed, the Sphere of Jupiter, the benign law-giver, organizer and preserver. He will then understand how the force he desires must be balanced and held in equilibrium. Finally, he will consider its Qliphotic manifestation, that is to say, its nature when unbalanced and degenerated. He will then have a clear understanding of the whole problem and be able to see it in perspective against the background of the cosmos as a whole, and he will also know the pathologies he has to guard against, and in what direction the force is liable to go if it becomes unbalanced. For instance, the Qliphah corresponding to Geburah is the Sphere of the Burners, for unbalanced Geburic force leads to cruelty and destruction. It is very necessary to make this careful analysis of the problem before proceeding to the construction of a talisman, otherwise one may make bad worse by intensifying the trouble. The quarrelsome man, for instance, who has already got too much Geburah in his composition, might try to invoke more Geburah in order to get himself out of the hot water that this quarrelsomeness has got him into. Whereas what he needs is a talisman for Chesed, Mercy, the opposite quality to Geburah. If he draws in more Geburah when he has already got too much Geburah, the result is Qliphotic. Having arrived at a clear understanding of what he intends to do, and knowing that he will have to shoulder the responsibility of any mistakes he may make should he have failed to diagnose his problem correctly, the operator then proceeds to design his talisman. 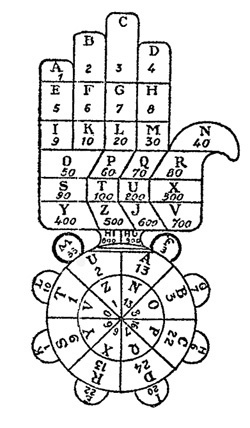 Certain geometrical forms, colors, letters, numbers, and many other things, are associated with every type of cosmic force; these are classified into thirty-two types, corresponding to the ten Holy Sephiroth upon the Tree of Life, representing ten types of primary force, and the Twenty-Two Paths that connect them; these are classed as secondary or derivative forces, arising from the equilibrium of the pairs of Sephiroth they connect; they did not emanate directly from the Source of All Force, but were generated in the course of the development of the different Sephiroth; the Sephirotic forces are spiritual in type, but the influences of the Twenty-Two Paths must be termed astral, for want of a better expression. 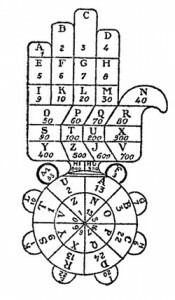 In any talisman, therefore, the Sephirotic aspect will be the spiritual influence, and the specific mundane application will be sought in the symbolism of the appropriate Path; if the diagnosis has been correctly made, it should be one of the Paths connected with the selected Sephirah. The symbolism will then be inter-related. A talisman is best made of either parchment, which is the dressed skin of an animal, or sheet metal, for experience shows that these hold the magnetism better than ordinary paper. It is interesting to note that the substances that have been traditionally used from time immemorial are those which modern science knows to be good conductors of electricity. The substances, such as silk or wood, in which tradition instructs us to encase our talismans in order to conserve their energy, are the same that modern science has proven to be effectual as non-conductors. The old adepts said: Do not use ordinary paper for a talisman, as it will not hold the force. The modern mechanic knows that there is nothing better than a piece of paper as an emergency insulator if he has to deal with a live wire. There is an elaborate system of attribution of the metals to the different planets – gold to the sun, silver to the moon, iron to Mars, – and theoretically, talismans for a particular force should be made from the appropriate metal. In actual practice, however, this is not feasible; the solid gold talisman of the sun is beyond the means of all save millionaires; the lead talisman of Saturn is too weighty for practical use; the iron talisman of Mars is liable to rust. The simplest and most practical method is to use a copper base enameled with the symbolic colors. And this brings us to the question of the nature of the efficacy of talismans. Why should a talisman be made of lead, or tin, or gold, according to the force it is designed to carry? In what way does it influence the force, or the force influence it? In the present state of the exact science, our knowledge of the occult arts is largely empirical. That some sort of subtle electrical factor enters into the matter there is good reason to believe, for tradition instructed its students to deal with magical forces after the manner of an electrical installation thousands of years before anything was known of electricity. There are many weird and wonderful recipes in folklore and witchcraft that have no value save the psychological one of prolonging attention and generating emotion by the ready means of fear and horror, but when we find traditional practices in accordance with an electrical analogy, we are justified in assuming that they are based upon practical experience in handling a force of an electrical nature. It is extremely probable that recently developed instruments for magnifying and measuring electrical charges of very low potency would yield some very interesting results if applied to magic. We may be justified in speculating that subtle electrical changes do take place when an amulet or talisman is charged, and that these are due to the personal magnetism of the person consecrating it. That personal magnetism is heightened by ceremonial work is a fact well known by experience to those who practice the occult arts. We may therefore conclude that the use of an electrically active material out of which to make a talisman has a basis in experience. But what shall we say of the colors, symbols and names that go to make up the talisman itself? These can have no electrical effect one way or the other. In my opinion, their importance is psychological, but in a more extended sense than that term is generally understood. Let us consider an analogy. In an electrical power station, the switch-box, in addition to the word: ‘DANGER!’, may have a skull and cross-bones painted on it bright scarlet, thus causing even the most scatter-brained to pause and think. Now, why is the skull and cross-bones a more potent symbol than the word: DANGER and why is scarlet paint more effective than black? Because skulls and skeletons are associated in our minds with death, and red with blood. So it is with the magical symbols. Even the uninitiated associates these odd-looking scribbles with power. To the initiated, ‘conditioned’ to symbolism, they convey a sense of a particular kind of power. A talisman is only effective when the person who makes it has performed meditations upon each of the symbols inscribed upon it, so that they are full of significance for him. In making these meditations, he builds up a thought-form in the astral light corresponding to each force thus dealt with; when he inscribes a symbol on the talisman, this thought-form he has made is associated with it; thus is the astral storage battery charged, the thought-form in the astral light being a link with the cosmic force represented. If he has not performed such work as this, and the symbols have no real significance for him, the resulting talisman will have no more than a superstitious value as giving rise to auto-suggestion. The real value of a talisman lies in the work that I put into it; therefore second-hand talismans made by some one else are only of use to the superstitious, like the quack medicine bought at fairs. But there is no question about it but that the mental work that goes to the making of a talisman has a very real effect upon the personality, definitely energizing it in the chosen direction, and that the power thus generated goes far beyond the influence of a purely subjective auto-suggestion. Let this be noted, however, — it is not the talisman that is doing the work, but the energy that has been put into the talisman. Miracles do not happen, if, by a miracle we understand an arbitrary interference with the natural sequence of cause and effect; magic, in my experience, always works through natural channels, its efficacy lying in the increase of energy that it causes to flow in those channels. If you make a talisman for wealth, you will not find a shower of golden sovereigns falling around it, but you may, and very probably will find that opportunities for increasing your earning power will come your way, and provided your temperament is sufficiently energized to enable you to take advantage of them, you will, by means of the normal channels, achieve prosperity – the normal channels being sound judgment, adequate skill, and hard work over a prolonged period. If you think to acquire anything in heaven, earth, or the Qliphotic waters under the earth by other channels than these, talismanic magic will prove of no more use than appeals to rich relations. Talismanic work will give you energy, as can be readily understood in the light of the psychology of auto-suggestion; it will also give you opportunity, as can only be understood in the light of the occult hypotheses, but it cannot enable you to avail yourself of that opportunity by any means save your own capacities. A talisman is like any apparatus for physical culture – the developer does not develop your muscles, it is your use of it that develops them.